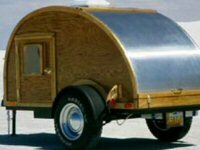 Teardrops n Tiny Travel Trailers • View topic - Best Ways of Applying Epoxy? Best Ways of Applying Epoxy? plyood interior and exterior? to get a nice even layer..or layers. Can it be sprayed on? Last edited by Classic Finn on Tue Apr 18, 2006 8:37 am, edited 1 time in total. What I do - this is for finishing a guitar - I mix the epoxy and use a old plastic credit card. Using the card - I pickup some epoxy and just scrap it on the wood - working it into the pores. Apply and work in one direction and smooth it out as thin as possible. Work in a small area and continue. If I get it on too thick one can sand it down with 220 grit paper. Some else will have a better idea then this - but it works for me.. I deal with epoxy and paint the same way.... no. 1, get it on... no.2, get it smooth.... most times, no. 1 & no.2 are mutually exclusive. no.1 usually involves a roller or bristle brush. but with expoxy, several thin coats wins out over less thick coats almost every single time. I'm not trying to highjack the thread, but I am still confused. Is epoxy the same as fiberglass? ...or when you say "epoxy" you are referring to some type of polyurethane? Last edited by doug hodder on Tue Apr 18, 2006 8:57 pm, edited 1 time in total. How about an epoxy "workshop" at IRG this summer? Just a quick and dirty, this is it and this is how you do it. Use a 2X2 piece of scrap. What brand of epoxy would you recomend for application on the outside of a tear. Taking into account ease of use, durability and UV protection. I'd be happy to hear anyones opinion of a favorite. Where did you get it? We didn't get it, we built it! I do not know for sure, but don't think epoxy has uv protection. I think it is usually coated with poly spar with uv protection..... others will know more. do a search on "epoxy uv protection"........... do a search on this site (use the 'ctrl' key plus the 'F' key (for 'find') and put in uv..
That would be good enough. You are more of an expert than most of us so that makes you, THE MAN! I mixed up my homebrew bondo the other day, it wasn't too bad to sand. I used West 407 which I've read is microballoons based (whatever that means) I also bought some micro balloons from the hobby store to experiment with. - Microballons (or microspheres) are tiny hollow spheres of glass (yes, really!) and they are a lightweight filler that just add volume to the resin. - Microfibres are tiny cotton (or other) fibres and boatbuilders sometimes call them 'scrambled egg' as that's what they look (a bit) like when dry. Microfibres add strength and ductility to a resin mix. - Silica (fumed silica) is a 'thixotropic' agent - it makes resin mix stiffer and more like a paste, before it cures. Trade names are Aerosil and Cabosil. The silica makes the resin mix after curing harder. Before mixing, silica looks and feels really light - a puff of wind will blow it away! - Wood flour is dust from woodworking and is used to incease volume and to colour match to adjacent wood. - Just adding microballons will make a lightweight fairing filler that is easy to sand. If it was to be applied thickly in some places, a little silica (no more than 1:10 to the microballons) would make it stay in place better before it cures. - Just adding silica will make a filler that is so hard as to be unsandable by hand when cured - only a sanding disc in an angle grinder will touch it. - Just adding microfibres will make a superb wood glue - good strength and (unlike most strong glues) good ductility and impact resistance. Again, adding a little silica will help it stay in place before curing. - A blend of equal parts of microballons, silica and microfibres makes an excellent filleting filler - easy to apply and to smooth, strong, just about sandable, and ductile. Incidentally, I think it is the fillet that most non-users of epoxy need to learn about. Everyone understands the idea of a glue, and many understand the idea of a fiberglass-taped joint, but the use of an epoxy fillet instead of a strip of wood or glass to join two pieces of ply is very valuable, particularly where the joint isn't a simple right-angle. I'm just working on the Roswell design at the moment and the filleted joint is the only way to sensibly build that. Here is a diagram of a fillet joint - my personal rule of thumb is that the leg length of the fillet should be 1.5-2 times the thickness of the ply. I used the microfibers (West 403) to bond the faces to my sidewall frames, worked out fine. I'm using the West 407 to fill in the low spots and holes where the screw heads were counter bored. What I meant was, What else in in there if it is microballoon based? Maybe it has some silica mixed in with it? The straight microballoons from the hobby store looks different. The 407 is like a light reddish color whereas the stuff from the hobby store is pure white. The hobby store stuff also seems more fluid. I really wanted the 410 but I couldn't find it locally. I'm happy with the 407, it was fairly easy to work with. Here is a clip from the West Systems page. It pretty much says the same thing that Andrew said. This strong, wood-toned filler is good for use in glue joints and fillets on naturally finished wood. It mixes easily with epoxy and lets you create fillets that are smooth and require little sanding. Its color is a consistent brown, so 405 can be used to modify the shade of other WEST SYSTEM fillers. 406 Colloidal Silica is a thickening additive used to control the viscosity of the epoxy and prevent epoxy runoff in vertical and overhead joints. 406 is a very strong filler that creates a smooth mixture, ideal for general bonding and filleting. It is also our most versatile filler. Often used in combination with other fillers, it can be used to improve the improve strength, abrasion resistance, and consistency of fairing compounds, resulting in a tougher, smoother surface. Color: off-white. 410 MicrolightTM is the ideal low-density filler for creating a light, easily-worked fairing compound especially suited for fairing large areas. Microlight mixes with greater ease than 407 Low-Density filler or microballoons and is approximately 30% easier to sand. It feathers to a fine edge and is also more economical for large fairing jobs. Not recommended under dark paint or other surfaces subject to high temperatures. Cures to a tan color. Be aware there are two different kinds of resin products commonly used with fibreglass cloth, epoxy and polyester. Epoxy has superior water resistance compared to polyester at a very superior price compared to polyester. Much of the automotive fibreglass (EG: Corvettes and Fieros) is polyester with epoxy being used on boats, planes and with non glass reinforcements like Kevlar and carbon fibre. Whether the additional cost of epoxy is warranted on a teardrop where the fibreglass is mostly/only acting as a sealant is trade off the builder should consider. Many plywood boats built with polyester resin since the 50s have survived decades in and out of the water. Commandant Louis Joseph Lahure has a singular distinction in military history - he defeated a navy on horseback. Occupying Holland in January 1795, the French continental army learned that the mighty Dutch navy had been frozen into the ice around Texel Island. So Lahure and 128 men simply rode up to it and demanded surrender. No shots were fired.